Load it up with liquor and mixers, choose a cocktail, watch as your drink is made in seconds. When it comes to throwing parties, you're a mover, not a shaker: Expert at mingling, amateur at mixing drinks. 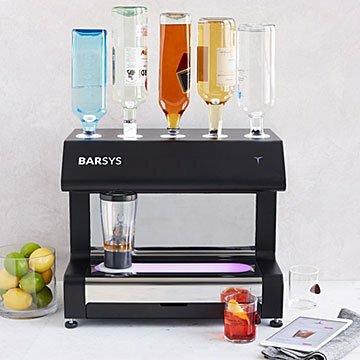 Here to ensure your guests are properly fortified is this robotic cocktail maker. Load it up with liquor bottles and mixers, use the app to choose either a pre-loaded cocktail (thousands to choose from) or one you've created yourself, then watch in awe as your drink is made with the precision of a master mixologist in less than 30 seconds. That means less time waiting for a G&T, and more time laughing with your VIPs. Made in India. Akshet Tewari came up with the concept for the robotic cocktail maker during finals in the last semester of his engineering program. During a night of partying, he wished a machine would pour him his next cocktail. Necessity, they say, is the mojito of invention. 19.6" L x 13" W x 15.7" H; Weighs Approx. 55 lbs. Using the Barsys app (available on iOS and Android), tap the Automated Cleaning Process feature. Coolest product and worth it!